Relationships of all kinds — human, structural, spatial, visual — were the forces at play in this compelling, colorful remodel and addition. The Eugene home of Andy Traisman and his partner, Lola, is a study in relationships and transformation. The same might be said for anything that is purposefully altered to better satisfy its users. But this house, built in 1922 and subjected to a hodgepodge of alterations over the decades, ascended to its new, truly harmonious state only after relationships between spaces and uses were defined; problematic structural relationships solved; and human relationships nurtured during a major renovation fraught with stressful potential. Traisman, a middle-school teacher, bought the house eight years ago. Lola moved in earlier this year after the addition of a 350-square-foot master suite atop the once flat-roofed garage and a total renovation of the other 2,000 square feet of living space. One goal was clear from the outset: to build the bed and bath above the garage, which itself had been added to the two-story house — along with an upper-story bedroom and unfinished utility room below — by previous owners in the early 2000s. “The main challenge was structural; the roof wasn’t going to carry it,” says architect and longtime friend Nir Pearlson, who was privy to some of those rooftop gatherings. Pearlson signed on to design the project despite Traisman’s initial hesitation. Pearlson, working with general contractor Paul Allen (of Allen Co. Design It! Build It!) and structural engineer Craig Lawrence, devised a solution that involved strategically placing new footings and posts with beams beneath the floor of the suite. They also puzzled over ways to eke out usable space for the bed-bath unit, which is offset between the first and second levels of the house. For example, the corner formed by the upper wall and ceiling of the first-floor pantry is just below countertop level of the new bathroom. The vanity’s cabinet doors offer no clues to this space-saving configuration, though inside are shallow storage spaces that extend just a matter of inches before ending at the pantry’s outer wall. Just as human and structural relationships required careful navigation throughout this project, relationships of the occupants to their environment were fully considered. Fixes, he says, included replacing a previously removed wall to turn an open dining room into an office; adding a door off the living room and new windows for light and indoor-outdoor connections; opening up a “funky” entryway vestibule and creating an obvious artery from there to the back of the house through the kitchen. “The kitchen always bugged me,” says Pearlson, who lamented the awkwardly placed refrigerator along a partial wall that hemmed in the room. “I wanted to figure the kitchen out because it’s so central to the life of the house. I felt it was important to create this passage very clearly here,” he says, pointing along the line that now extends from the front door through to the stairway at the rear of the house, carried visually by the alignment of a new butcher-block kitchen island and row of hanging pendant lights. Copious windows and vibrant, varied colors brighten the refreshed home. Twenty-seven different hues coat the interior and exterior in a rainbow of warm tones. 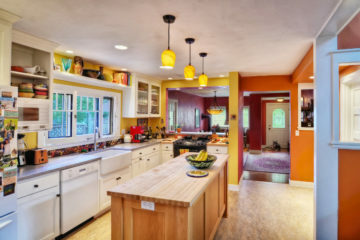 At the junction between the dining room, kitchen and living room, rich red, yellow and orange shades converge harmoniously at wall corners — successful relationships made possible by Traisman’s countless paint-sampling trips to The Home Depot and consultations with painter Steve Derminer. The once light-gray/sage-green interior now radiates color not only from the walls, but from artful accents including Leonie Daniels’ multi-hued mosaic backsplashes of recycled tile in the kitchen and master bath. And that would seem to portend well for a long, happy and interesting relationship with this well-evolved home. Posted in News, Publications, Residential.